Have you ever tried an Irish Coffee? This year I’m enjoying one with whiskey sugar added! It’s a great treat to serve in honor of St. Patrick’s Day. 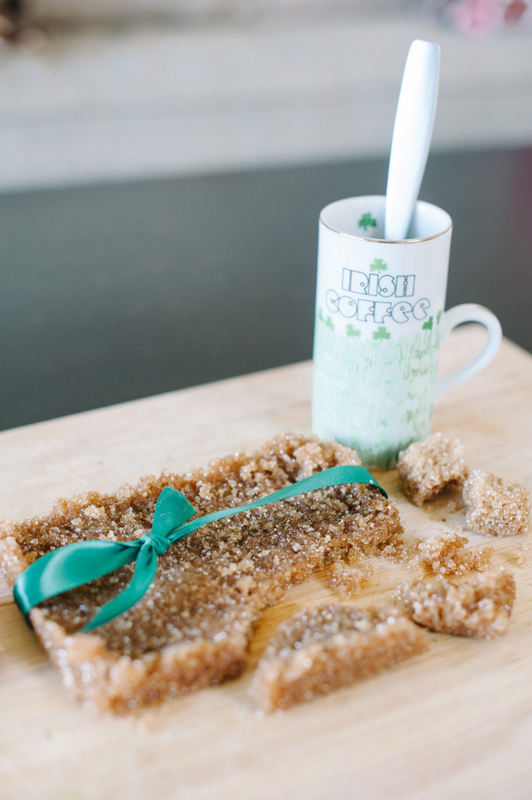 Make the perfect Irish Coffee with the help of our homemade whisky infused sugar recipe! We created this sugar with the tastiest whiskey we love. It lends a perfect touch to an otherwise mundane cup of coffee. 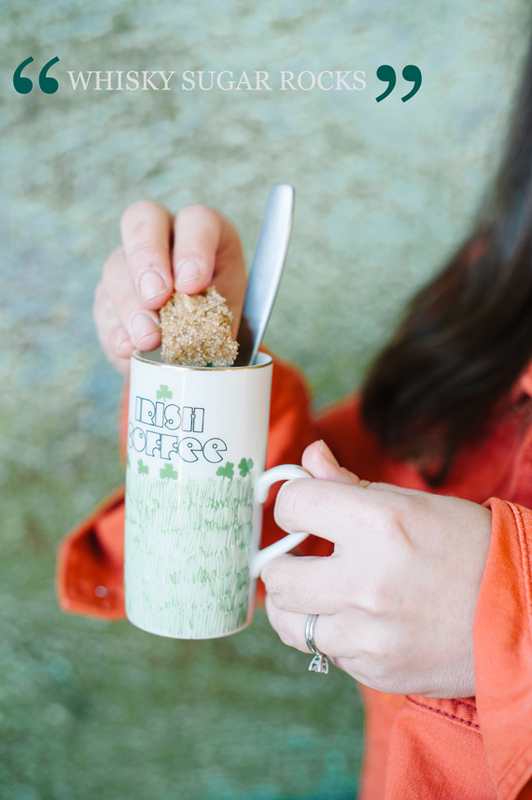 The sugar makes an Irish Coffee a cinch to pull together. 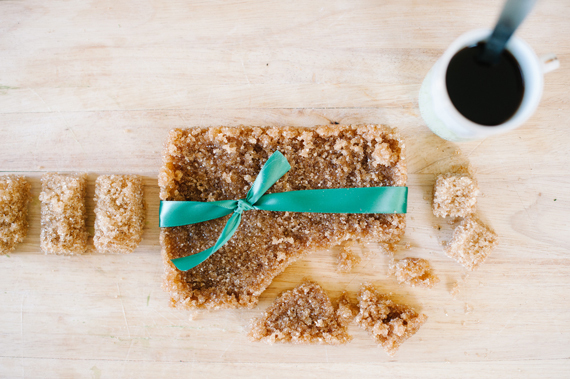 And with a pretty bow a rock of this whiskey sugar becomes a great gift to celebrate the holiday or a hostess gift any time of year. 1. Start by combining the whiskey and sugar in a bowl and whisk together until combines. The sugra should get a bit hard like the difference between dry sand and mud. 2. Spread the wet sugar mixture onto a baking dish and let dry overnight (mine took about 36 hours). Break off into pieces and add to coffee to make an easy Irish Coffee. Add a little 1/2 and 1/2 then top with whip cream if you’d like. Enjoy! PS. You could also use the whiskey sugar to top these rainbow waffles for an awesome St. Patrick’s Day morning! (Photography ©A Subtle Revelry by Pictilio). Great idea! I need to try this. This is great. Where did you get the cute mug? What a cheap and easy gift for St. Patty’s day. So many of my friends would love this. How surprised would they be to receive a little something special on St. Patty’s Day? I tried to make thIs for St. Paddy’s leaving an extra day to dry just in case. After 72 hrs it was still mushy (but with a crust… in a good way). Remixed it to make it evenly moist & spread it thinner on a parchment lined baking sheet. Another 72 hrs and it was still damp & crumbly. How sad! Jenn, I ran into the same thing. I added a cup of sugar which wasn’t great for the flavor and it still took an extra couple days. Messing with it before its dry makes it crumble. Even crumbled, it would be great in a jar. Next time, I am going to try just *barely* warming it to see if it will get harder faster. I also tried it with white sugar – gross and boring and ugly. That’s definitely raw in the photo. Can’t stress enough to line the dish with plastic wrap or wax paper or something, especially if using white sugar. Will definitely make again. Good stuff.